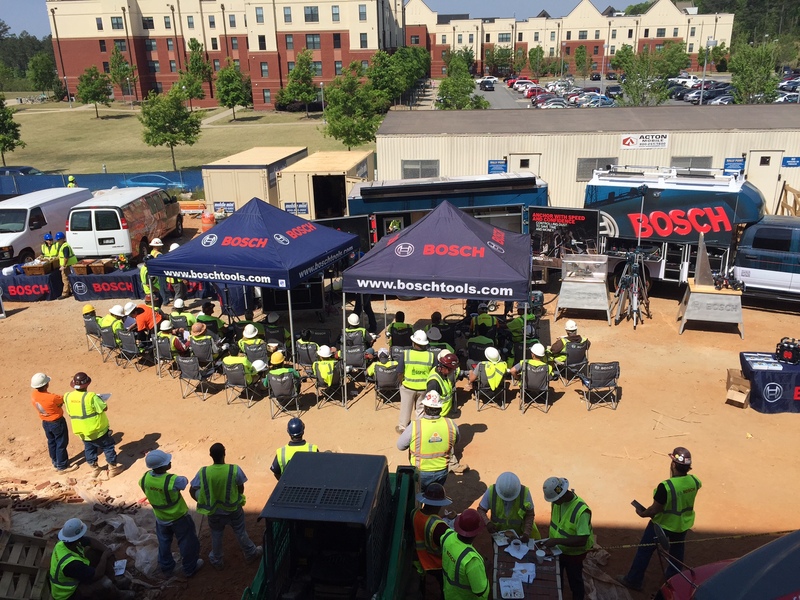 The Bosch Power Tour is how Bosch Tools is connecting with construction industry professionals to help them navigate OSHA's silica dust rule and other health and safety issues on the job. The Bosch Power Tour is their unique way to reach construction pros who are too busy building doors to open them? Getting access to jobsites isn’t a simple task. The men and women working on construction sites are dedicated to their work, often managing tight deadlines and budgets along with the physical challenges that come with the job. And while their noise tolerance levels may be high, their tolerance for idle chatter is exceptionally low. In short, they don’t want to take time out of their day to listen to a sales pitch. Bosch has been a part of the North American construction industry for more than a century, delivering the information and products construction companies, contractors and workers need to make their jobs easier, safer and more efficient. Building on that legacy, the Bosch Power Tour offers training that’s tailored to trade professionals, providing trainers who lead jobsite programs on topics that range from safety to productivity. It’s real-world, hands-on training that helps attendees better understand industry regulations and best-practice power tool usage. And there’s no sales pitch. With over 150+ stops on its six-month journey, the Bosch Power Tour is a hands-on education and innovation center that allows users to get the information they need and to learn about new products and systems. Each Bosch Power Tour event includes a visit from a Bosch-themed one-ton Ram® 5500 with a Knapehiede KUV body and a customized 17-foot tool trailer. This year the Bosch Power Tour has partnered with Ergodyne and Simpson Strong-Tie to make stops at jobsites across the U.S. and Canada. Ergodyne brings unparalleled expertise in working at height and managing heat stress. Simpson Strong-Tie is an industry leader in adhesives and anchors used in concrete applications. Their participation in the Bosch Power Tour brings an important dimension to discussions about compliance and protecting workers from the hazards of respirable crystalline silica dust. Together, this knowledgeable team will address the top three safety concerns facing the construction industry today: Meeting OSHA requirements, tool innovations that keep workers safe and improve productivity, and the steps construction professionals can take to better protect themselves on the jobsite. By working side-by-side with the people who build offices, schools, warehouses, cities and towns, Bosch is helping to create a better construction industry for everyone. The cornerstone is employing innovative products that help people work safer, faster and more efficiently. To learn more about the Bosch Power Tour, click here.